In this article, we shall learn how to assign a Macro to a button in Excel. Let’s start. 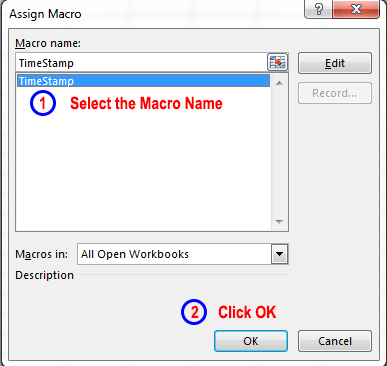 If your macro is a general-purpose macro and you plan to use it in more than one workbook, make sure that this macro is stored in your Personal Macro Workbook. Choose Developer ➪ Controls ➪ Insert, and then click the icon identified as Button (Form Control). To find out the form control button, move your mouse pointer over the icons, and you will see a ToolTip that will describe the control. See the following figure. Now select the worksheet and drag in the worksheet to draw the button. Whenever you release the mouse button, the Assign Macro dialog box will appear. Click OK to close the Assign Macro dialog box. A button will appear in the worksheet. You can change the text that is displayed on the button to make it descriptive. To do so, right-click the button, choose Edit Text from the shortcut menu, and make your changes. Click this button to activate the TimeStamp macro. After performing these steps, select any cell in the worksheet and click the button to execute the assigned macro in it.